So… the bad news first. We thought the house we’re building would be finished to move in this summer, but it’s now going to be at least the end of September. There is some good news though! Even though our temporary apartment is tiny, we’re lucky enough to have a good-sized yard that will help keep all my kids entertained all summer. That also means that although I can’t plant flowers in the ground, I can put out some cute planters. 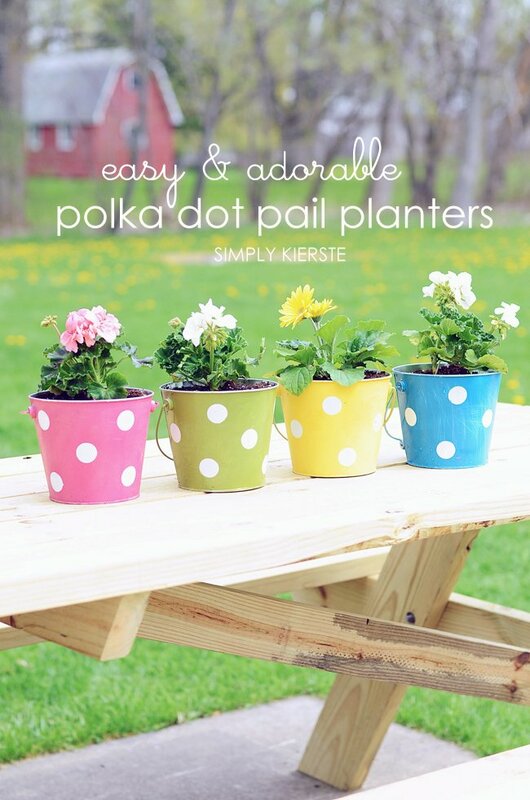 Since I’m kind of obsessed with pails, I thought they would be perfect planters for our picnic table and patio. They were super easy to make, and I love how they turned out!! I came across these particular pails at JoAnn Fabrics, right in their container section (baskets, pails, etc.) and they already had the plastic liner inside, perfect for plants. It didn’t have holes in the bottom of the pail, but those are easy to make with a drill and bit made for metal, or even with a nail and hammer! I used some fun bright colors (Rustoleum spray paint: Eden/green, Ocean Breeze/blue, Berry Pink, Sun Yellow), and then polka dots…of course. :) It was an easy project, and they are so perfect on our picnic table. I will like them on their a lot more once it’s actually painted–we just built a new one, and used treated lumber, so I’m trying to be very patient for 4-6 weeks until it’s ready to paint. 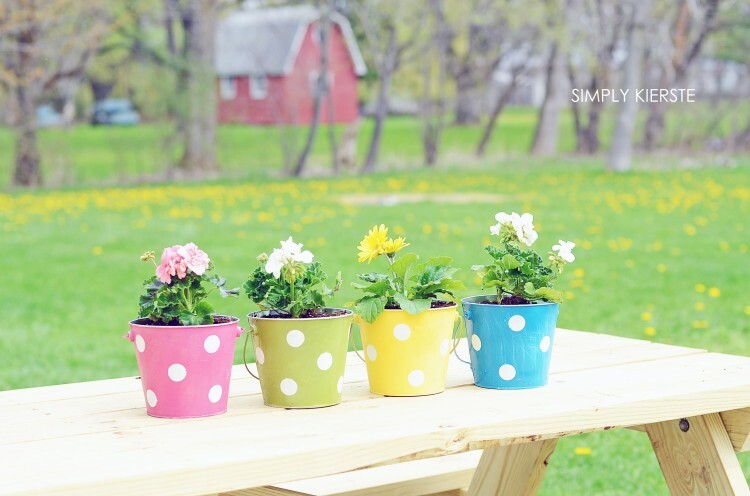 I love these pails because they’re great for indoors, outdoors, in large spaces, and small spaces! If you’re in an apartment and want one or two for window ledge, or on a balcony, or if you have more space on a front porch or patio–they’ll be perfect! 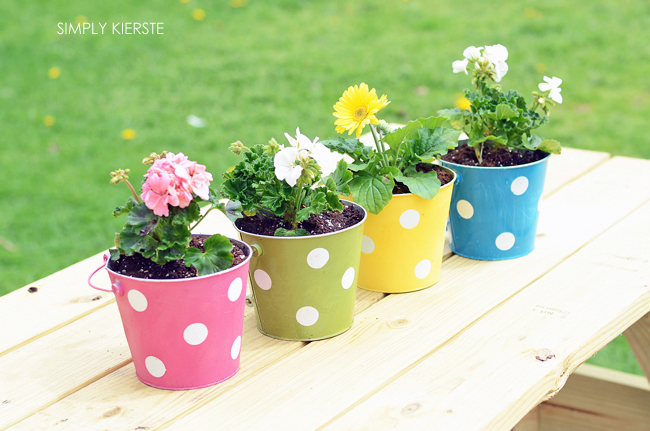 How cute would these be as centerpieces for a summer BBQ or party? Bridal or baby shower? You can change the colors to match a theme or color scheme! 1. 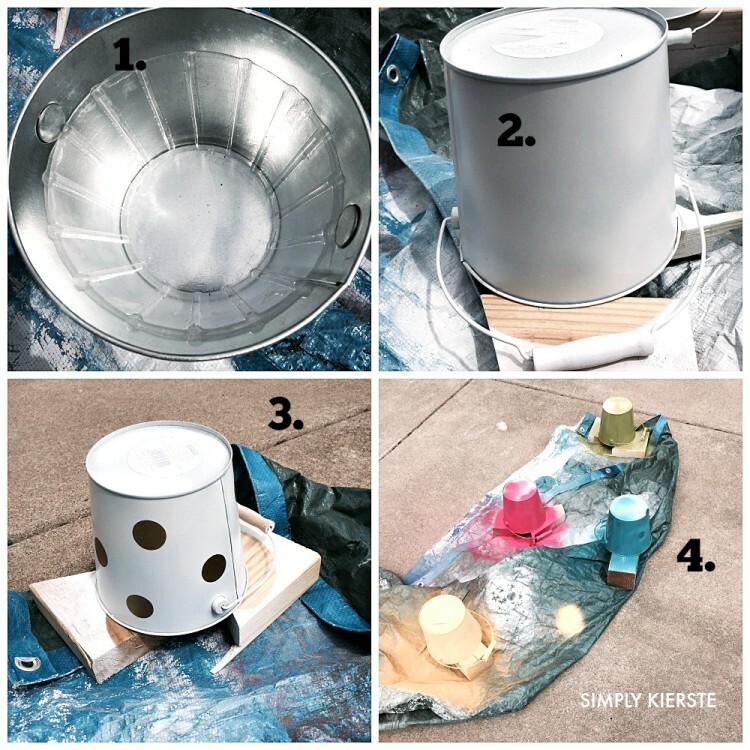 Spray your bucket white, or the color you want the dots to be, and let dry completely. I use scraps of 2×4 on top of a tarp, so the bucket won’t rest on the ground while painting. 2. Add your vinyl dots! I used my Silhouette to cut mine out, but if you don’t have one, you can actually buy vinyl sheets and use a 1 inch circle punch to cut them out! Make sure you push them on firmly, so the paint won’t bleed through. 3. Spray on the top color, and let dry completely. Remove the dots! I like to take a piece of medium grit sandpaper and rough things up a little, because I like the distressed look, but you don’t have to…whatever you like best is great! 4. Use a drill and bit made to go through metal, or a hammer and nail to add holes to the bottom of your pail. If your pail didn’t come with a liner, you can always cut up a piece of a trash bag and make your own. Once you add the soil, just tuck the ends in, and you won’t be able to see them. That’s it!! Simple and adorable, my kind of project! 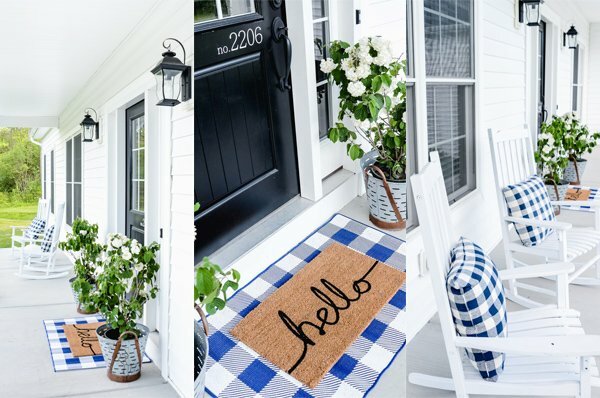 You will totally want these for your backyard or front porch this spring & summer! 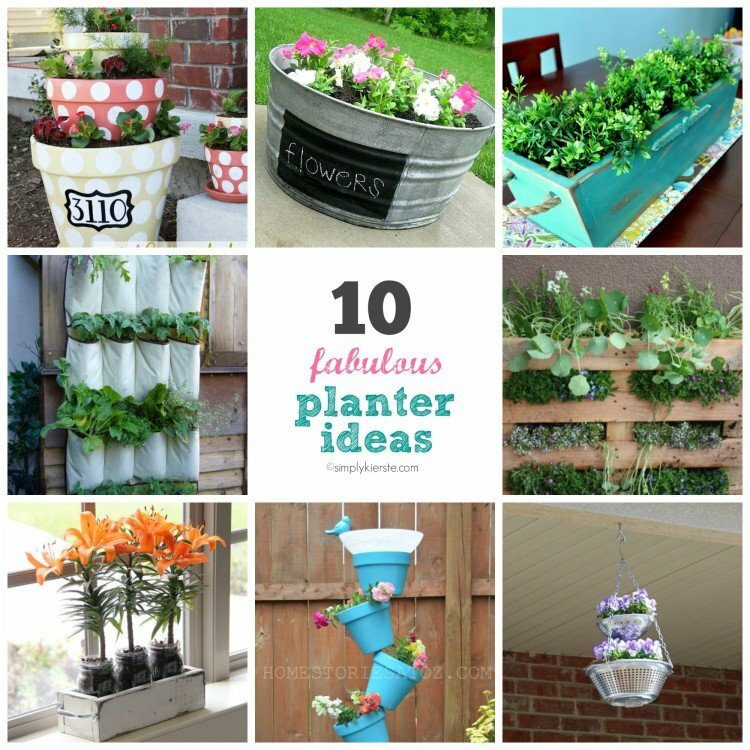 For even more fun planter ideas, here are 10 more to check out! !